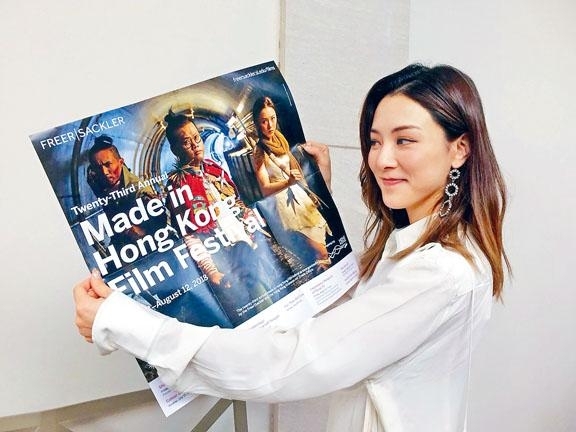 HKSAR Film No Top 10 Box Office: [2018.08.01] "ZOMBIOLOGY" TAKES VENUS WONG TO THE U.S.
[2018.08.01] "ZOMBIOLOGY" TAKES VENUS WONG TO THE U.S.
Venue Wong Yik Man and director Alan Lo Wai Lun with ZOMBIOLOGY ENJOY YOURSELF TONIGHT (GUM MAN DA SONG SI) were invited to attended the 23rd Made in Hong Kong Film Festival in Washington. They both felt happy and honored. Wong Man Yik said, "I am very honored to be able to represent ZOMBIOLOGY and attend the film festival. I look forward to bringing this film to the American audience. The zombie culture is very popular in the U.S. I want to see what they think about Hong Kong produced zombie films. After learning that ZOMBIOLOGY is the only Hong Kong film that was invited, I was even more surprised." Wong Man Yik bought a surprise gift for boyfriend Derek Tsang Kwok Cheung. She said, "Washington doesn't have many shopping districts. I happened to be there on a weekend and was able to go to a flea market to buy a gift for him."